The 1961-1963 Buick Special Skylark is credited with being a highly underrated pioneer of the sporty compact idea. It's ideal transportation now for those collectors who'd prefer to drive a pleasant everyday car that can be sold later for more than they paid for it. Values should keep pace with the rate of inflation, and may even exceed it slightly. 1962 Buick Special Skylark convertible. See more pictures of Buick cars. Convertibles are naturally more desirable than the coupes, and more expensive. Buick's aluminum V-8 gives decent go. An efficient V-6 was available for 1962-1963, and delivers good economy. Quality and luxury are surprisingly good, with great attention paid to soundproofing for that big-car feel so beloved by Detroit. It's still quite contemporary compared to much newer designs. 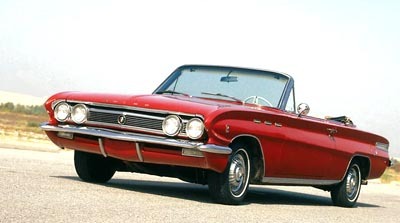 For more 1961-1963 Buick Special Skylark specifications, go on to the next page.